Gallery Hours: 10 am-5 pm, seven days a week. David Brosch is a teacher and resident artist at Montpelier Arts Center who received his BA in fine arts and a BS in architecture from the University of Maryland. He most often creates representational imagery that includes landscapes and portraiture. The printmaking techniques he employs to produce his metal-plate etchings are very traditional. Ball Movies experiments with the physics of balls of all kinds, sizes, and materials. Neil Feather combines the balls of bowling, billiards, ping-pong, marbles, croquet, and magnetic in moving situations with tilted turntables, springs, serving trays, drums, pendulums, and speakers to create a unique musical experience. Short videos will be used to showcase this musical concert. The 37th annual Montpelier Invitational Sculpture Exhibition will take place in the Main Gallery at Montpelier Arts Center. Various artists from the region are invited to exhibit contemporary sculpture. To register for the Artist Talk/Luncheon, please call 301-377-7800 by Friday, June 1, 2018. Melissa Burley combines reclaimed items that may include glass, test tubes, furniture parts, and automobile and bicycle components and then illuminates them with halogen or LED lighting. The ultimate goal of her work is to elevate these recycled materials to a level that suggests there is beauty in life after death and to open the eyes of others to consider their role in the preservation of our earth. Longtime resident artist and instructor at Montpelier Art Center, Irene Sylvester, creates mixed media collages with paint and paper exploring abstract thoughts and forms through natural shapes, human figures, and various textures. The concepts of history and consumerism give Paint and Paper a unique twist that stays true to Irene’s passion and background in fashion. Linda and Roslyn have often exhibited together since they feel that clay and fiber complement each other. 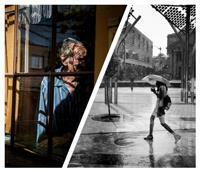 The exhibit concentrates on series—exploring ideas from three perspectives. Linda explores varied surface techniques in clay, while Roslyn hooks wall hangings of trees, arches, and people using various fibers. Organized by the Laurel Art Guild, this annual exhibit is juried by a regional professional and showcases works by artists ages 18 & older who live in the Washington metropolitan area and includes paintings, drawings, photographs, sculptures, collages, and more. Montpelier Arts Center strives to foster a positive, creative environment in which young and emerging artists realize their full potential as creative individuals. In honor of National Youth Art Month, Montpelier spotlights teens (ages 13-18) in the Washington metropolitan area and their talents in the visual arts. Taylor’s jazz series features collages comprised of torn bits of magazines that celebrate the most original and influential artists of jazz. The first stage of the series is in black and white and represents the past and the second stage is in color to represent contemporary jazz. In Care of the White House presents a selection of documents and reproduced artworks sent to and from the White House, demonstrating the tradition of communication between citizen and government. Steven H. Silberg is an image-influenced, material-based, process-oriented, cross-media artist with a background ranging from photography to book conservation. 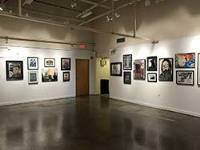 Montpelier Arts Center is proud to honor Black History Month through an exhibition of contemporary artwork that reflects the lives and perspectives of the African American experience. Using symbolism and found objects, artists explore the journey and history of being black through painting, mixed media, and sculpture. Inspired by classical Indian mythology, Parikh uses clay, terra cotta, ceramics, and batik to depict various elements of the animal kingdom. She focuses on horses, beetles, bulls, and rams, as well as the human form. Mesinger’s signature one of a kind freeform designs and her use of organic shapes are coupled with geometric and textured surfaces. In Twisted, she creates a series of increasingly intricate handmade fashion forward jewelry in gold and silver. Chloe Irla maintains an interdisciplinary studio practice grounded in both traditional and alternative approaches to painting and drawing. However, her recent work investigates the data visualization of increments over specific time-periods. Year One is based on one year’s worth of data collected about her daughter’s first year of life. To celebrate the diversity in the United States, various artists express themselves with work based on identity using drawing, painting, photography, and more. 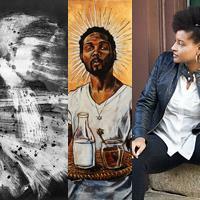 With insightful perspectives, artists cover themes that relate to gender, race, and sexuality. Themes that relate to all of us. In the antithesis of a curated show, artists answer a general call for entries, inspired by the theme “Giving.” This exhibition is open to all Maryland, Washington D.C., and Virginia artists, ages 18 & up. Participants are asked to bring one piece of art per person and a donation of five canned goods. To receive a prospectus, contact Montpelier Arts Center at 301-377-7800. — mixing traditional techniques in new hybrid ways. Naka allows the materials to help her create the image. 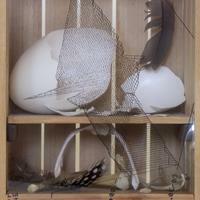 She collaborates with the medium rather than trying to force it towards an “unnatural” perfection. 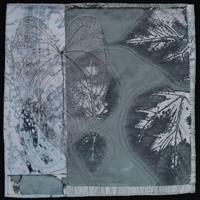 Her prints capture the fleeting moments of experience within life and nature. People from all over the world can connect with Naka’s artwork as it creates an ongoing dialogue, reflecting a long conversation about life, death and the human spirit. Naka believes one should speak out to keep the environment safe and healthy in order to maintain a successful art world. After a career running a premier accounting recruitment agency in Washington, DC, Barry Goldstein sold his business to pursue art. He enrolled in a traditional fine arts program at the Schuler School of Fine Arts in Baltimore, MD and juried into the Copyist Program at the National Gallery of Art in Washington, DC. Painting on the museum gallery floor, he learned directly from the Masters by copying the works of Raphael, Rembrandt, Bellows, and Twachtman. Continuing his studies in figure drawing, painting, and sculpting with distinguished artists, Goldstein developed skills with materials and techniques, explored new creative processes, and began to see our physical and non-physical world in new ways. In his capacity on the Board of Directors of The Washington Sculptors Group, he collaborates with nationally and internationally renowned art institutions and artists to develop programs for members, art students, and the public. 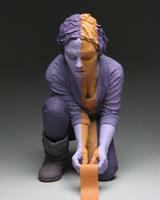 At first look, Abrams’s pieces suggest the fluidity of fabric, but in fact, are actually polymer clay. As a man-made substance, polymer clay begins as blocks of solid-colored clay-like material that does not require water to become soft. Unlike clay from the earth, polymer clay can be blended like paint. Math and geometry also play a large role in her work because each piece consists of baked clay shapes that, when complete, must fit together on the canvas. Her training in architecture and urban planning inspires her use of geometric forms and, Abrams revels in the math required to create this art combining both left- and right-brain experiences. The 36th annual Montpelier Invitational Sculpture Exhibition will take place in the Main Gallery at Montpelier Arts Center. Lori Ulmer-Hanson’s exquisite forms exemplify her artistic expression, which evokes strong emotions in art lovers of all genres. Working in a diverse array of media including hand-sculpted raku clay, wood, stone, and metal sculptures, she recently added acrylic paintings and welding to her portfolio. 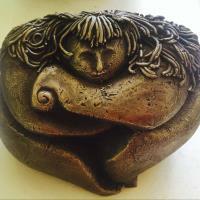 Collectors around the world appreciate her raku and bronze sculptures. 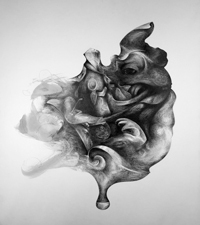 The female form is a dominant theme in her work, capturing its beauty and elegance in unique and compelling representations. 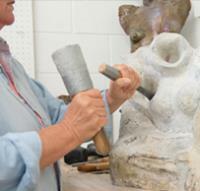 Ulmer-Hanson's formal training began at Sam Houston State University, where she received her BFA specializing in sculpture. She continues her studies in ceramics and graphic arts/film editing. 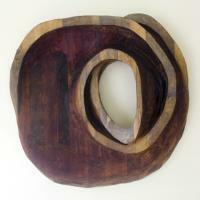 She continues to exhibit in juried, invitational, and one-woman shows and galleries. A former member of the Houston Art League and Rockport Center for the Arts, she has been involved with the Waco Center for the Arts' Open Door Show. David Brosch received his BFA from the University of Maryland College Park, where he concentrated in printmaking. 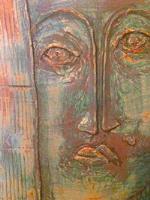 Upon graduation, he continued painting and drawing but lacked a facility to enable him to do printmaking. Enrolling in a class at Montpelier Arts Center in the early 90s, he applied for an open space in the printmaking studio. Brosch juried in and has been a resident artist ever since, as well as printmaking teacher at the Arts Center. 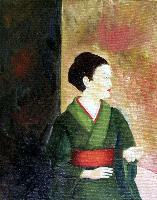 Several of his students have also continued the tradition, becoming resident artists themselves. Brosch’s preferred methods of printmaking are intaglio and linocut, where the image created on the plate or block is the negative or reverse of the final printed artwork. Brosch enjoys this challenge of “thinking backwards” as well as the experimental process of printmaking. In a world that is becoming increasingly noisy and conflict-filled, Brosch seeks quiet and beauty in the people around him, in his community, and in the places he has visited. After 30 years as an advertising photographer, graphic designer and computer illustrator, Talbott brings this experience into her work. 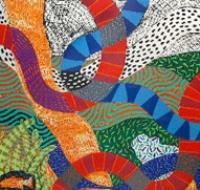 While at MICA, she studied the textural works of Jasper Johns, Jim Dine, and Frank Stella. The way these artists handled materials and created work so tactile made a distinct impression. It is the need to replicate the texture and surface of life that propels her to discover new ways to use materials and processes in everything she makes. Ellen Cornett’s charcoal and graphite drawings reveal the humorous and serious, often tragic undertones of fairy and folk tales. By using well-recognized sources, she manipulates characters into odd vignettes of conflict, misunderstanding, and relationships gone awry. In addition to these finished pieces, Cornett will create a large charcoal drawing on paper along the gallery wall aligning with other pieces in the show—a little whimsical, a little challenging, and a little dark. 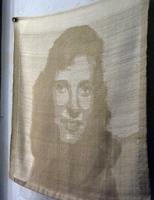 Visit her in the gallery to discuss and see the work in progress. She will also be documenting her process with daily reports on her blog and social media. Artists explore drawing and painting on non-traditional surfaces such as cardboard, fabric, ceramic, and other unique supports. The 2017 Black History Month exhibition examines the development of sacred music within the African American community. Through the stories behind the creation of spirituals, hymns, and gospel music, this exhibit uncovers the tremendous importance of sacred music in the black community beginning in West Africa and extending to the 21st century. Simultaneously, the exhibit highlights the important contributions made by Prince Georgians in the realm of black sacred music as vocalists, instrumentalists, composers, and more. From sculpture, painting, and printmaking to rug hooking, jewelry, and mixed media, Montpelier Arts Center’s resident artists showcase their work in this group holiday exhibition. Join us December 4th for the reception and our Annual Holiday Open House, then visit the artists in their studios to see where and how they create! This exhibition features the work of documentary photographers turning the “lens” towards a personal project of their family, surroundings, or themselves. Bill Crandall’s “Fairy Tales from the Fault Lines” project is a dream-like vision of DC neighborhoods through the lens of a native Washingtonian. Away from the monuments, Crandall takes an unexpectedly poetic, personal view of life in the changing urban landscape, especially along the shifting central “fault lines” of a long-divided city. As an immigrant to the United States, Gabriela Bulisova has a complicated relationship with her native Czechoslovakia, returning at least once a year to visit her family in her mother’s hometown; a small village of 800 people in southern Slovakia called Chl’aba. Along the way, she began a very personal project in collaboration with fellow photographer, Mark Isaac, which documents her family’s life and the village around them. Patricia Phillips Bowden, who holds a BFA from the Corcoran College of Art & Design, continues her explorations of art through paintings on a variety of surfaces and through the creation of mixed media pieces. Using a vast collection of found objects gathered over the years, she finds they inspire her work by their craftsmanship, design, and surface changes such as the effects of rust or being crushed. Using pieces of these objects, Bowden repurposes them into a new, interesting, and more exciting presentation. The tactile quality of oil painting appeals to her for its textural possibilities as well as its viscosity and vibrancy of color. While studying architecture at Yale University in the 90s, Patrick “Mackie” Cromwell first began experimenting with intaglio metal plates. Decades later, in looking for a printmaking studio, he found David Brosch, a resident artist and printmaking instructor at Montpelier Arts Center in Laurel, MD. 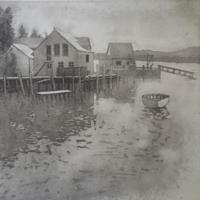 Through classes with Brosch, he expanded his techniques which enhanced his love of the chance nature of printmaking. Sometimes he may start with an idea or inspiration—a nighttime shadow on the wall, a light at the end of a tunnel, or the texture of a metal chair—but his instinct is the guiding force behind his artwork. Experimenting with aquatints, glue, spray paint, drypoint, paper maché, wet colored tissue paper, and sharpies, Cromwell often sees different objects and places after a print has been run. He delights in these “happy accidents” that express his “waking dreams.” Influenced by the work of M.C. Escher, Cromwell finds the creative process helps him discover and connect to his interior life. After the reception, enjoy a classical recital by Peter Pakhomkin on guitar at 3 pm. The population of Prince George's County ebbs and flows like the rivers that flow along and through its boundaries. Due to educational aspirations, military service, and/or familial obligations, citizens of Prince George's County often find themselves filled with nostalgic memories of home or excitement of returning to a place "filled with love and affection." Artists featured in Home, Again focus on innovation (new materials and techniques or new twists on traditional styles), process, and transformation. All artists live, work, and/or have their studios in Prince George’s County, MD. Motivated by mystery, Allen Linder’s drawings are a record of his search for and revelation of his imagination. As described by one curator, “They are improbable inventions tethered to a reality created in the act of making.” For over 30 years, Linder was a sculptor. When he began drawing, his impulse was to describe form; to create the illusion of form through light and dark. Pen on paper makes a mark. Marks build into suggestive patterns, textures, layers, and movements. The play of light and dark creates the illusion of form. Forms emerge and dissolve into light, dark, and one another. He works from all points of view until up and down suggest themselves and he sees something he knows but has never seen before. Instead of questioning the origin or implications of his drawings, he only wants to enjoy their mystery. Inspired by everything from classic science fiction to found objects, Steven Williams uses a process of intuition, accident, and chance. His mixed media works meet at the intersection of surrealism and abstraction. Various artists are invited to create site specific installation work in response to the gallery space. In this body of work composed of ceramic figurative sculptures, Kevin Rohde examines our relationship with clothing, and its use as a symbol to question ideas of consumerism, classicism, and societal development. The similarities between the fiber of fabric and the fiber of muscle blur and become interchangeable, questioning our relationship to the natural world. Darkness, humor, and hope all play their part to express a truth of our culture. 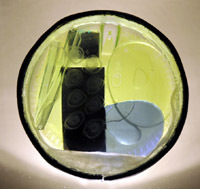 Melissa Burley combines recycled items that may include metal, glass blocks containing colored water, test tubes, furniture parts, lab glass and bottles, automobile and bicycle components and then illuminates them with halogen or LED lighting. The ultimate goal of her work is to elevate both man-made and recycled materials to a level that suggests that there is beauty in life after death and open the eyes of others to consider his or her role in the preservation of our earth. The title of this exhibition, "LESS IS MORE," is reflective of Judith Kornett’s intention to create sculptures that are fewer in number but deeper in content. Thematically the pieces in this show express the belief that less violence will create a more peaceful world. Kornett has invited others to create small works of art to be included in an installation that will be the exhibition’s titular piece. Proceeds from the sale of this installation, or parts thereof will be donated directly to organizations or services that offer aid to victims of violence. Cianne Fragione and Seth Adelsberger push the limits of their respective media to reveal the immediacy and spontaneity involved in the creative process. Using paint, textiles, paper, and assemblage, Fragione creates work that combines three narrative elements: her childhood growing up in an Italian immigrant neighborhood in Connecticut, her previous dance career in ballet and jazz, and her visual art training in the San Francisco Bay Area during the beat and funk movement. Baltimore-based artist Seth Adelsberger questions traditional notions of painting and printmaking through the use of unusual materials and rearrangement of the standard steps in artmaking. Working in a collage-like manner, Dominie Nash builds up layers of fabric to create a sense of mystery and depth. Paying special attention to the coloring and patterning of fabrics, the uneven and serendipitous results contribute to the spontaneity and expressiveness of the work, even though the composition may be planned in advance. Using both abstract and representational forms, Nash invites the viewer to return and see different things at each viewing. Montpelier Arts Center strives to foster a positive, creative environment in which young and emerging artists realize their full potential as creative individuals. 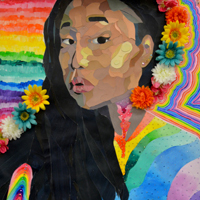 In honor of National Youth Art Month, Montpelier spotlights teens (ages 13-18) in the Washington metropolitan area and their talents in the visual arts. To apply, go to montpelierartscenter.submittable.com. Deadline for online submissions: Friday, January 15, 2016, 11:59 pm. For more information, contact staff at montpelier.arts@pgparks.com or (301) 377-7800 for a prospectus. By combining printmaking techniques, digital manipulation, hand-colored processes, and recycled past artwork, Winston Harris seeks to produce images that provoke and promote self-awareness and spiritual enlightenment. He invites the viewer to consider a variety of themes: how American Jazz might look as visual sound; the unification of different ethnicities; celebrations of commemorative events in American history, especially significant to African American history and culture; and the harmony between nature and spirituality. In Re-Invention, Harris hopes to promote, motivate, inspire, and educate participants with unique opportunities from both an academic and professional direction. Montpelier Arts Center is proud to honor Black History Month through this exhibition celebrating African American heritage and identity. Antonio McAfee, Tiffany Jones, and Stephen Towns share their insights about identity through the media of painting and photography. Using historic photos, personal journeys, and portraits, these Baltimore-based artists help the viewer understand the importance of history and identity in contemporary times. Montpelier Arts Center’s resident artists showcase their work in this group holiday exhibition, highlighting their diversity and talent. From sculptures and painting to printmaking, rug hooking, and jewelry, nearly every media is represented. Join us on December 6th for the reception and our Annual Holiday Open House, then visit the artists in their studios to see where and how they create! A practicing artist for 50 years, Sushama Parikh graduated from the J.J. School of Arts in Mumbai, India. She later received her MFA in sculpture at the École des Beaux Arts in Paris and finally settled in the United States. Although her primary background is in sculpture, she has exhibited in a variety of media, including batiks. 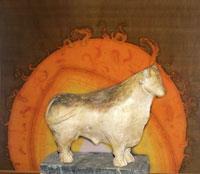 Her recent work includes iridescent ceramic wall tiles, plates, and studies of horses and bulls. Caroline Thorington’s "Menagerie" includes a compendium of lithographic fine art prints about animals. She drew animals as a child and saw no reason for excluding them as she grew older. Animals creep into her work uninvited and take it over. They make puns and play jokes, hide and make ribald statements. They are animate beings that tell stories, and Thorington only draws them as they want to be: sometimes fantastical beings, other times creatures of legend and myth, and occasionally they are just themselves: frogs, beetles, bulls, rhinoceroses – portraits of living, breathing creatures. In the antithesis of a curated show, artists answer a general call for entries inspired by the theme “Gratitude.” One piece of art per person is accepted and hung until the walls are full. In exchange for this opportunity, Montpelier Arts Center requests a donation of five canned goods that will be donated to a local food pantry. This exhibition is open to all Maryland, Washington, D.C., and Virginia artists, ages 18 & older. For details, please contact Montpelier Arts Center at 301-377-7800. For over thirty years, Montpelier Arts Center has provided the residents of Prince George’s County and surrounding areas access to learning from some of the leading artists in their field. From ceramics to printmaking to rug hooking to digital arts to drawing and painting, beginning and experienced students have developed their skills under the guidance and expertise of these instructors. Join us in celebrating our instructors’ works of art that have inspired so many. Abdi Darai combines worlds of geometric constructions, art, and multi-layered structures of nature. By exploring non-linear transformations of iterated function systems, Darai renders beautiful and mysterious images that emerge from dark spaces. These hidden chaotic worlds are revealed through fractional dimensions that exist alongside us unseen, but real, nevertheless. Darai is an associate professor of mathematics at the University of the District of Columbia. 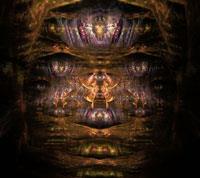 He designs fractals both as a passion and a scientific pursuit. Through his photographs, Richard Paul Weiblinger reveals a passion for exploring our world by transforming everyday views and objects into art. Preferring subjects that lead to images with chromatic strength, he uses creative lighting to not only illuminate his subjects but also to give them a dream-like, surreal quality that speaks of their subtle elegance. For many years, Linda Bernard and Roslyn Logsdon have come together as artists and friends. They have exhibited together at the Montpelier Arts Center where they both have studios and teach. In previous exhibits – "Windows," "Structures," and "Surfaces" – they have picked themes that were explored in their different mediums: clay and fiber. Linda’s explorations for this exhibition are spherical forms and the visual textures of under glazes applied onto her sculptural pieces. 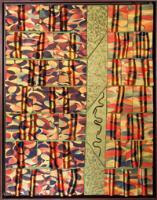 Her love of fabric is translated onto other pieces with impressions and under glazes as in quilting patchwork. Roslyn has continued her interest in Gothic arches – forming towering structures in various color studies. In other hooked wall hangings, her people are gathered in groups having lunch, tea, or wine. Another path her work has taken is an abstract study of trees. 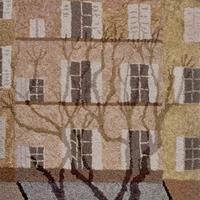 The skillful rug hooking students at Montpelier Arts Center transform their unique personal stories into original works of art in this group exhibition. Creative and imaginative, each piece stands as an independent statement. Located in Mount Rainier, MD as part of the Gateway Arts District, White Point Studio was established in 2014 by ceramic sculptor, Laurel Lukaszewski. Serving as both her home studio and the studio of six other professional and emerging artists, this exhibition will showcase their new work in a variety of media ranging from clay installations to psychological clothing to ceramic totem poles. Through the tactile nature of thick, action-filled paint strokes, Andrei Trach expresses moods and ideas through color, texture, and movement. Each work is a distinct orientation, enabling the viewer to see an optical mix of colors and textures. Three-dimensional aspects accent the dramatic and the bold in his paintings, which are a visceral response to and expression of his world. David Brosch received his BA in fine arts and BS in architecture from the University of Maryland. While his concentration was in printmaking at school, he paints as well today. 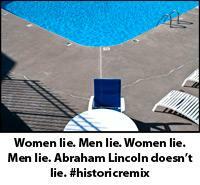 Regardless of the media, his artwork usually comprises of representational imagery and strong colors. Patricia Phillips Bowden, who holds a BFA from the Corcoran College of Art & Design, continues her explorations of art making by utilizing mixed media to create this salon-style exhibition. Intaglio printmaker Patrick Cromwell presents his first solo show at Montpelier Arts Center with works for his time at Yale University and in the studio at Montpelier. Wayson R. Jones explores the idea of implicit association between imagery, memory, and emotion through manipulation of texture, shape, and color (or lack thereof). His new work evokes abstracted figures, imaginary landscapes, faces, and objects. They represent the "vignettes": subjective snapshots of events, persons, or objects in motion, and "visages": abstract faces combined with objects that symbolize parts of childhood. Organized by the Laurel Art Guild, this annual exhibit is juried by a regional professional and showcases works by artists 18 & older who live in the Washington metropolitan area, and includes paintings, drawings, photographs, sculptures, collages and more. 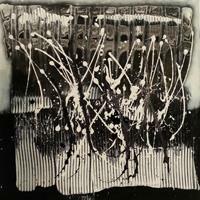 With monoprints, acrylics, encaustic paint, oil bars, other media, Ellyn Weiss strives to create art that speaks directly to the heart without mediation or explanation. Montpelier Arts Center strives to foster a positive, creative environment in which young and emerging artists realize their full potential as creative individuals. In honor of National Youth Art Month, Montpelier presents this juried exhibition spotlighting teens (ages 13-18) in the Washington metropolitan area and their talents in the visual arts. Juried by a regional professional, this annual exhibition organized by the Patuxent Art League showcases work from artists 18 and older who live in Maryland, D.C., and Virginia; it includes painting, drawing, photography, sculpture, collage, and more. The resident artists at Montpelier Arts Center showcase their work in this group holiday exhibition, highlighting their diversity and talent. Lori Ulmer-Hanson’s debut solo exhibition at Montpelier displays current works that reflect a passion for creating faces and figurative forms using a diverse array of media, provoking different moods—sometimes with laughter, and other times, with quiet force. Van Wagoner’s sculptural work captures moments in a narrative and expresses them as artifacts that reminisce weekends on dairy farms and amongst rolling fields on corn. In this series of current works made from steel, cast aluminum, cast iron, blown glass, clay, and other materials, Comforts of Home reflects the changing value placed on land, agricultural practices and food in our culture. 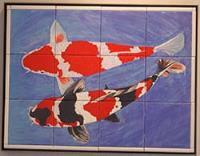 The Library Gallery at Montpelier Arts Center showcases local artists selected by a juror. John Paradiso, program manager at the 39th Street Gallery and facility manager of the Gateway Arts Center in the Prince George’s County Gateway Arts District, served as the juror for the 2014-2015 Library Gallery Competition. In the antithesis of a curated show, artists answer a general call for entries, and every piece of art is accepted and hung until the walls are full. This exhibition is open to all Maryland, D.C., and Virginia artists, ages 18 & up. To receive a prospectus, contact Montpelier Arts Center at 301-377-7800. Fine jewelry designs by Karen Mesinger Miller, and iridescent ceramic sculptures and wall tiles by Sushama Parikh complement each other in the joint exhibition of works by these Montpelier studio artists. The need to replicate the texture and surface of an object propels Barbara Talbott to discover new ways to use materials and processes in everything she makes. In Tarnished, every dent, every scratch, every layer of patina builds on each other to create the fabric of the surface. It tells the story of a life lived. This body of mixed media work from en plein air painter Patricia Bowden reveals her three-dimensional side using found objects collected over many years. Bauer composes mixed media sculptures by reducing objects to simple form that convey balance, tension and control, alluding to one’s continual journey in self-discovery. Play, a solo exhibition of acrylic paintings and works on paper, is the logical convergence of art and music, Boocks’ two life-long passions. 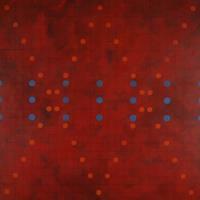 Works are accompanied by music that shares the same compositional structure as the painting. Through manipulation of tempo and effects processing, the music slowly changes over time. Boocks’ paintings investigate the viewer’s response to both the paintings and the music. Williams draws, paints, and constructs paintings, which depend on elements of surprise and surrealism to inject humor into what would otherwise be a relentless descent into the shadow side of human life. 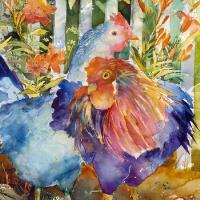 Nationally recognized watercolorist and former botanist David Daniels brings a unique personal sense of composition and color to watercolor, revealing the natural world through light and color, soaring with the delight he finds in the wonder of nature. His bold, impressionistic style gives freshness to the beauty of nature, and his inspired sense of color reveals his love and reverence for nature in his work. Shaped by materials found in her immediate environment, Burger's work is a reflection of her interest in how e relate to our natural world. "Exploring Materials, Methods and Meaning"
The Washington Sculptors Group is a non-profit corporation founded in 1984 to promote awareness and understanding of sculpture, and to foster the exchange of ideas among sculptors, collectors and the general public. Shaped by materials found in her immediate environment, Burger's work is a reflection of her interest in how we relate to our natural world. Melissa Burley exhibits new sculpture, recycled from found objects, and transformed into an exciting, new experience in sculpture. 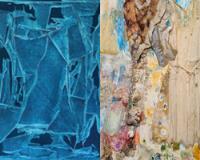 Longtime resident artist Irene Syslvester creates water media collages exploring space and the universe in a new way. Katherine Mann's paintings carefully balance fluidity and congestion, while Joseph Corcoran's sculptures explore the transmission, reflection and diffusion of light through glass. In this exhibition, the two artists come together to create collaborative works juxtaposing their two very different mediums--paper and glass. Combining exuberant abstract painting, detailed drawing, and blown and manipulated glass forms, these collaborative abstract pieces explore ideas of lenses, light and visual warpage. Montpelier resident printmaker Sahomi Naka expirments with different approaches and techniques to printmaking. She uses traditional printmaking methods in new hybrid ways. Using the camera as a mediator, fine art photographer Janet Matthews develops a relationship with the carnival community and brings audiences into the experience. Juried by a regional professional, this annual exhibit showcases works by artists 18 years and older who live in the Washington metropolitan area; includes paintings, drawings, photography, sculpture, collage and more. This juried exhibition is open to all DC, VA, and MD area teen ages 13-18 and will showcase their talents in the visual arts. Montpelier Arts Center is proud to honor Black History Month through this anthological exhibition of work from artists Michael Booker, Wayson R. Jones, Jacqueline Lee, Amira Rasayon, Ellington Robinson, Charles Sessoms, Valerie Watson, and Curtis Woody, whose work tells the story of the rich and complex story of black life. 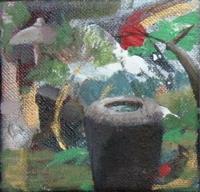 The featured artists combine mixed and/or multimedia techniques to present original works of art, spanning media from watercolor and collage to audio and video recording. The exhibition depicts the rich and complex story of life in Prince George's County through works by artists 18 and older. 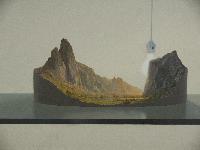 Featured artists combine mixed and/or multimedia techniques to stretch the limits of their media and present thoughtful and innovative works of art. Resident artists will showcase their work in this group exhibition, highlighting their diversity and talent. The artist digs into the relationship between human chaotic force and natural wilderness by combining traditional still life and landscape painting. The exhibition highlights extraordinary images created by Hiroshima schoolchildren who faced a truly unbelievable tragedy with unfaltering optimism, and features a screening of the documentary film, Pictures from a Hiroshima Schoolyard, directed by Bryan Reichhardt. The artists at DC Glassworks and Sculpture studios will give a live demonstration of blowing glass in the Venetian style to make contemporary pieces. using 2,300 degree molten glass from a 600 pound furnace, watch the artists work in teams to create a variety of works in clear and color. Beverages will be provided. DC Glassworks will show contemporary work that uses processess such as blown and cast class. Core members and instructors include David D'Orio, Steven Jones, Megan Van Wagoner, Joseph Corcoran, Matt Deal, Leo Lex, Karyne Messina and Patrick Burke. *Advanced reservations required by Monday, June 10 by calling 301-377-7800. In response to human interaction in advances of technology, the artist creates paintings that are sometimes uncomfortable or horrific. These paintings are sympathetic yet striking and provoke thought and compassion. 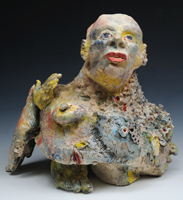 Ceramic figurative sculpture that is wood and raku fired draws an emphasis on texture, color, and detail with psychological and humorous undertones. Hassan combines knitting and painting to weave sculptural stories of connections to friends, family, and the idea of home. The exhibit consists of approximately fifteen pieces, a quilt and about fifteen individual photographs. The cornerstone of the exhibit is a photo quilt; it celebrates the lives of amazing black women who have made their mark in history. Juried by a regional professional, this exhibition showcases work from artists who are 18 years and older and live in the Washington metropolitan area, and includes painting, drawing, photography, sculpture, collage and more. This exhibition highlights African American service ad support of the U.S. Military from the Revolutionary War to the Vietnam War. During this two hundred year period, African Americans have fought, worked and sacrified in support of their country. Fighting on Two Fronts explores their efforts in the changing face of discrimination at home and abroad. Juried by two regional professionals, this exhibition showcases work from artists who are 18 years and older and live in Maryland, Virginia, and the District of Columbia, and includes painting, drawing, photography, sculpture, collage and more. This year's jurors are Emily S. Conover and Patrick M. Craig. The postmark deadline for entries is Friday, November 16, 2012. To receive a copy of the call for entry, please send an email to montpelier.arts@pgparks.com. The Montpelier Arts Center is pleased to present an exhibition featuring the fine art faculty of Bowie State University. The exhibition will feature the artwork of professors Phaedra Byrd, Clayton Lang, Gina Lewis, Clark Mester, Yanique Moore, Natalie Thomas-Wade, Doreen Vernon, and Robert Ward. Through mixed media collages, the artist observes the ways in which buildings, sufaces, and structures change upon abandonment. Using acrylic paint, found objects and images on masonite, the artist constructs paintings that draw from surrealism and abstraction. Using bamboo as a framework, the artist’s “Kites” make reference to flight, celebration of the seasons and travel that highlight many cultures. Mr. Davis created this exhibition with the collaboration of Jessica Beels, Bob Donahue, Kay Lindsey, Patricia Steck and Lynn Sylvester. An exhibition of recent paintings by Washington, DC professional artists Dana Ellyn and Matt Sesow. 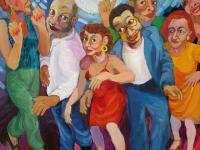 Ellyn and Sesow are known internationally for their colorful expressive interpretations of politics and pop culture. With this exhibit, the local artists take aim with their paintbrushes at the lexicon of "See Something, Say Something" and how it has changed the American zeitgeist. 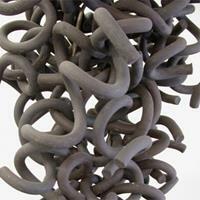 Porter creates ceramic sculptures that reflect organic shapes and the human body. Through the representation of a bird and woman, the artist creates collages that reference the passing of time and placement in the universe. Montpelier Resident Artist, Patricia Phillips Bowden, makes new acrylic paintings exploring her fascination with miniatures. 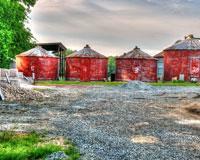 The Montpelier Arts Center is pleased to provide exhibition opportunities for emerging artists. 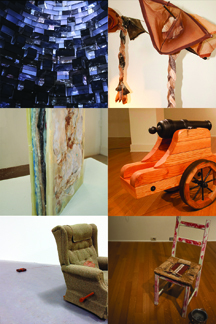 For this year 2012, the Montpelier Invitational Sculpture Exhibition will present works by nine young artists from the University of Maryland Master of Fine Arts degree program. 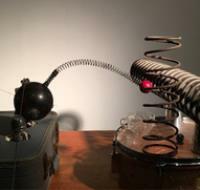 These artists present a wide variety of unique cultural and visual perspectives and explorations within sculptural media. Artists hail from as far away as France and as close as Baltimore. The media presented is as diverse as their locales, ranging from video installation to recycled objects to fiberglass, plaster, and even cast metal. Sculptors participating in the exhibition are Michael Booker, Mark Earnhart, Claire Girodie, Felicia Glidden, Bahar Jalehmahmoudi, Peter Karis, Pat McGowan, Lauren Moore, Lauren Little, and Adam Nelson. A reception will be held in their honor on June 8, 2012 from 7-9pm. 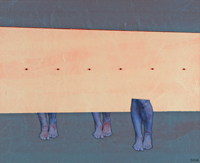 On June 7, 2012, Montpelier will host a slide talk with the artists. Lunch will be served at noon, reservations required. The reception and luncheon/lecture are free and open to the public. 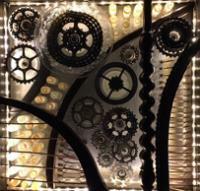 Montpelier Resident Artist, Melissa Burley, exhibits new light sculpture. Made from found objects, Ms. Burley recycles and transforms these objects into exciting, new works when mixed with LED lighting creating a new experience in sculpture. 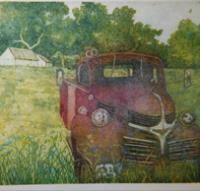 Ellen Hill will be exhibiting her mixed media collages constructed onto wood panels that are carved, painted and etched. These works speak to nature’s perseverance, assuring that the universe on a whole is in a good place. This is illustrated through representation and abstract imagery while using repetition and spontaneity that is often found in the natural world. Ms. Lee’s latest work explores how illumination is depicted within various cultures and societies. Using green-screen animation, video projection, and digital prints the artist reframes the history of painting, film and video in order to explore how viewers consume visual information in our technology driven society. A public reception in honor of the artist will take place on April 15, 2012 from 2-4pm. 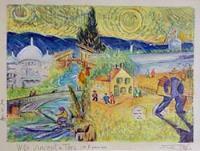 Montpelier resident artist, Rufus Norman exhibits for the first time in the Resident Artist Gallery. His colorful, imaginative acrylic paintings depict people, places, and still life. A reception for the artist will take place on April 15, 2012 from 2-4pm. Lacombe is a realist painter who uses geometry and neon signage to capture the urban environment. A public reception in honor of the artist will take place on April 15, 2012 from 2-4pm. 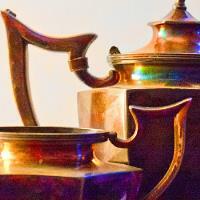 The Laurel Art Guild hosts their 43rd Annual Juried Exhibition in the Main Gallery of the Montpelier Arts Center. Sixty entrants have been selected from throughout Maryland to participate. A public reception and awards ceremony will take place on March 4 from 2-4pm. Renowned printmaker, Lou Stovall, will exhibit his own prints as well as collaborative works with Sam Gilliam, Peter Blume, and Lois Jones. Reception on February 3, 2012, 7-9pm. 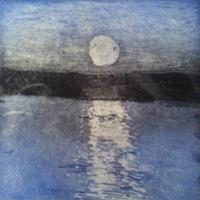 Montpelier Resident Printmaker, Sahomi Naka, experiments with different approaches and techniques to printmaking. 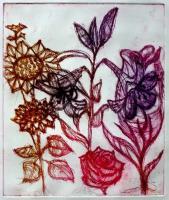 She uses traditional printmaking methods in new hybrid ways. 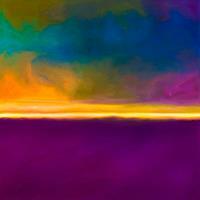 Reception for the artist on February 3, 2012, from 7-9pm. Natalia Panfile is a performance artist who will be investigating videos of past performances. She will be performing a piece called "Food for Thought" during the reception on February 3, 2012 from 7-9pm. 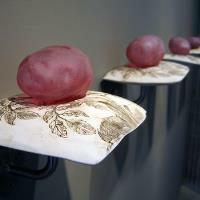 This piece investigates “issues of cleanliness and purity related to being my mother’s daughter……. and parallels my relationship with my motherland, Moldova”. For the piece, the artist will sift through 400 lbs of buckwheat grain placed on the floor where Ms. Panfile will be removing any impurities, reflecting the hard agricultural work of women from her native Moldova. 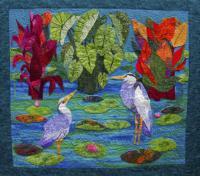 The exhibition includes mixed media collages, quilts and digitally altered photographs all drawn from the natural world. Jacqueline Lee is primarily a collage artist who works in diverse media. the impact of the elements upon the landscape. Using GPS coordinates and photography this series combines the virtual with the real—often with surprising results. Artist and Maryland Art Institute College of Art professor, Nate Larson will talk about the work in Geolocation, and the process of his collaboration with artist Marni Shindelman in a lecture on November 2. This lecture is the perfect way to begin FOTOweek DC. Fine jewelry design and intricate ceramic tiles featuring images of the peacock complement each other in this exhibition of works by Montpelier studio artists. Join the artists in the September exhibitions for a free public reception from 2-4 pm, September 11. 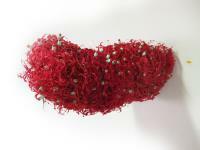 In the Resident Artist Gallery, Ceramics by Linda Bernard and Fiber works by Roslyn Logsdon. Poured paintings by Maryland artist are based on topographical imagery of the Chesapeake Bay watershed. Combining the natural forms of a found vine or branch with carved and painted cedar, the artist creates a true communion with nature in her sculptures. 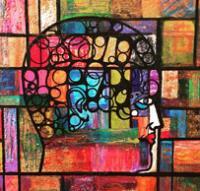 Ms. Rotenberg is one of the winners of the biennial Library Gallery Competition. Two diverse media explore a common theme.